Hoping to take advantage of the lack of party games for the Xbox 360 and PlayStation 3, Wideload Games is readying to release Hail to the Chimp in just a couple of weeks, on May 27. That VideoGame Blog had a chance to test-drive the game during a recent visit to Hail to the Chimp’s publisher, Gamecock Media Group. 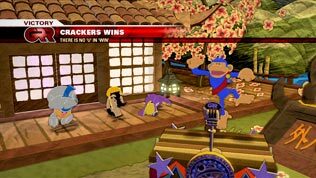 While the game at first may seem like a poor man’s Mario Party, Hail to the Chimp’s production values, graphics, humor and cynical view of American culture – and the presidential elections, of course – set this game apart. In the budget title, which will retail for $39.99, ten characters – ranging from a monkey to a hippo – compete in an election to become the king of all animals. The characters begin competing in primary elections all the way to the “presidential election” in a series of mini-game events with titles such as “Front Runner,” “Stuff the Ballot” and “Tally Rally.” Instead of votes, the candidates are vying for clams, which are an essential part of the gameplay in all of the 15 mini-games available. In total, there are 10 characters and ten stages. All of the mini-games can be played in any of the stages. In the tried-and-true formula of party games, up to four players can participate in the elections, and the game also supports online play. 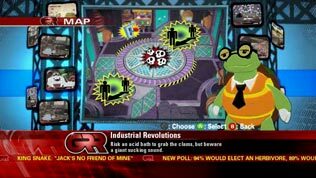 Right after the game loads, the player is presented with a news anchor that serves as a narrator of sorts throughout the game. If the player just leaves the game running, the newscast will continue, even with hilarious commercials that poke fun at real commercials, movies and TV shows. The newscast is so complete that it even has a ticker in the bottom with equally hilarious news bits. As the player progresses, more commercials are unlocked. Even before unlocking the massive number of videos available, it would take quite a long time for the game to repeat the news presented, as there are well over two hours of footage. In the same way in which Pixar movies appeal equally to children and adults, Hail to the Chimp’s colorful art palette and cartoony graphics (powered by Unreal Engine 3) are definitely aimed at a younger audience, but most of the best jokes and parodies will be mostly enjoyed by adults. During the hands-on time with the game, only two stages and a handful of game types were available. The core mechanic of the mini-games is to pick up clams that are scattered throughout the stage and either hold the most clams for a set amount of time, or take the most clams to crates or ballot boxes. Characters can punch or jump on top of opponents, and in an interesting twist to the gameplay, two characters can join forces for a short amount of time and gang up against the other two players. Once the special move is over, the two players can continue to attack each other. The stages are interactive, for example, in one of the two stages available for preview, there was a covered pool filled with water. The pool’s cover eventually breaks and anyone who falls on it will lose clams. Characters also lose clams after being punched by opponents. During the length of the mini-game, players will receive bonuses that allow them to have special powers or invincibility. While most of the mini-games revolve around very similar goals, and the limited amount of stages might turn off gamers and some reviewers, the humor and smart dialogue might be enough to give this budget title an edge. It’s just hard to imagine that the simplicity and repetitiveness of the games will keep players coming back for more. Hopefully the rest of the game types and stages that were not previewed will be enough meat to compliment the great side dishes of crisp graphics, voice work and humorous videos included in the game.